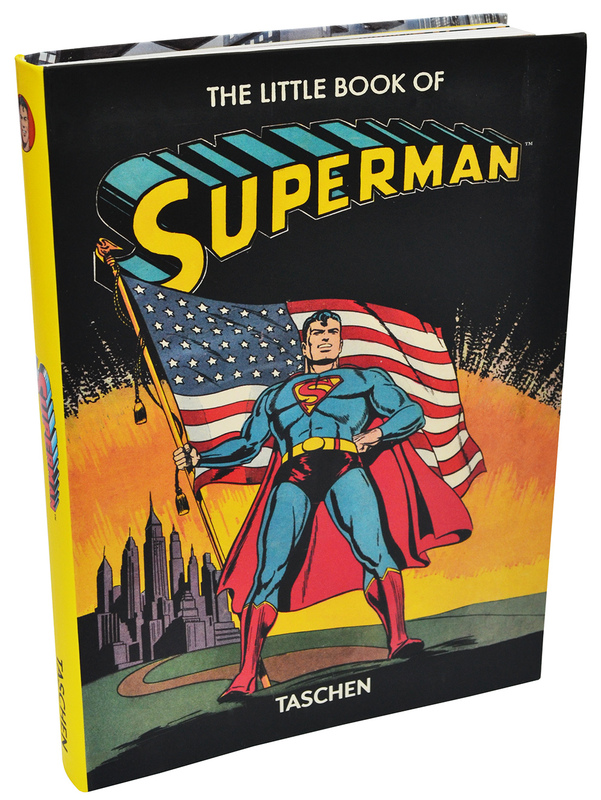 The Little Book of Superman (Taschen, 2016) | 'TAIN'T THE MEAT… IT'S THE HUMANITY! The Little Book of Superman is a fitting tribute to the world’s first — and many would argue biggest — superhero: The Man of Steel; The Last Son of Krypton; The Man of Tomorrow — Superman. 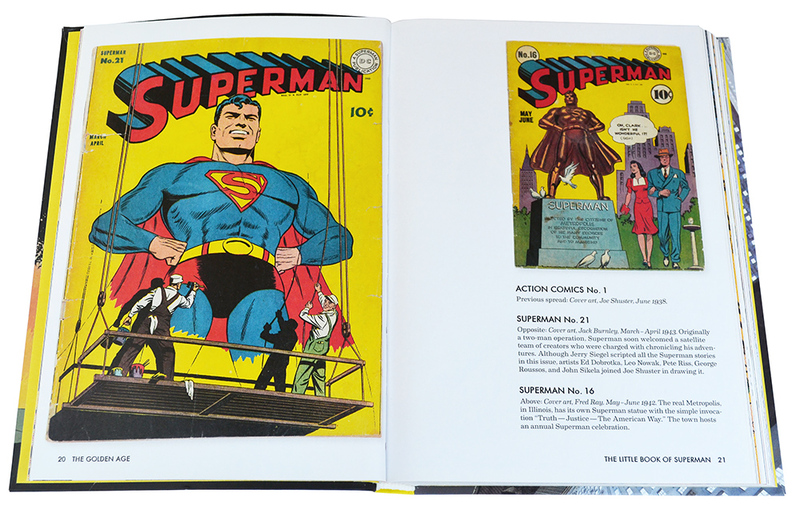 The Little Book of Superman — published by Taschen in 2016 — may be small in size (it measures just under 5 x 7 inches), but that doesn’t mean it’s light on content — the hardcover volume fits a surprising amount of content into its 196 full-colour pages. The book also features an attractively diminutive price-tag: it RRP’s for only £6.99/$9.99. 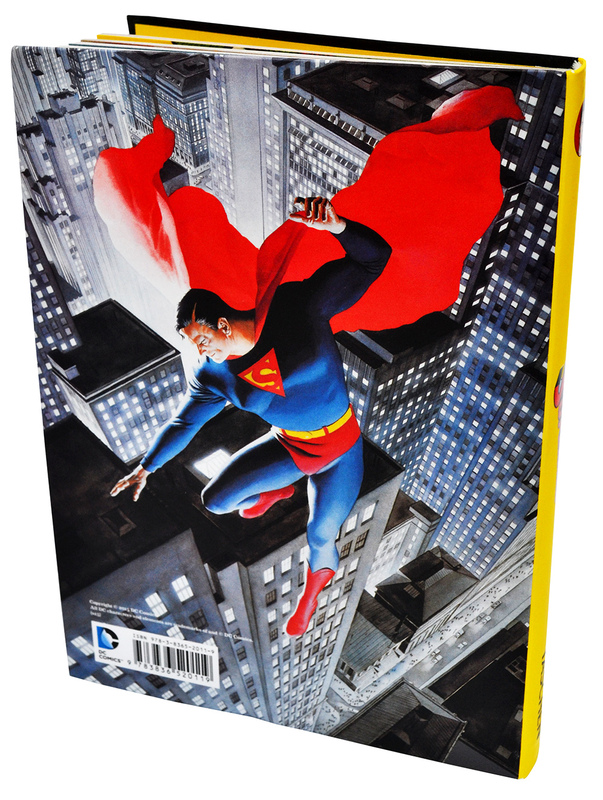 Alex Ross’s artwork adorns the back cover. 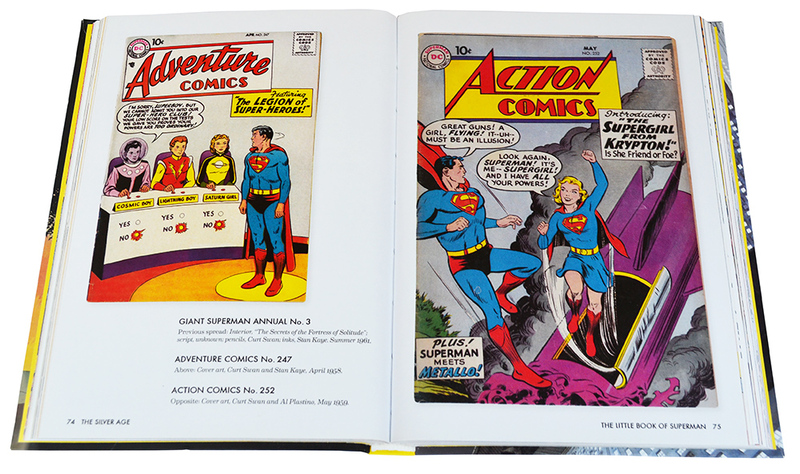 The book features reproductions of comic book covers, panels and other assorted artwork and merchandising from the iconic superhero’s 80-year career. The book is split into five chapters — The Golden Age; The Silver Age; The Bronze Age; The Dark Age and The Modern Age — that adeptly reflects The Man of Steel’s impact on both comic books and 20th Century popular culture. The Little Book of Superman, pages 20 and 21. From his first appearance in Action Comics in 1938, to his elevation to radio and TV star in the 1940’s and 1950’s, to his debut as a major box office attraction in the late 1970’s, the defender of Truth, Justice and the American Way has become a media phenomenon, easily recognised throughout the world. 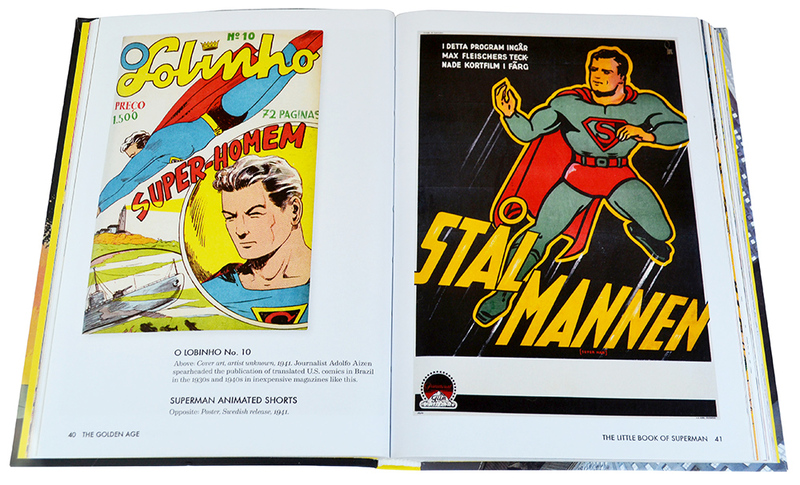 Both foreign language versions of Superman’s comics and animated shorts are showcased (pages 40 and 41). The Little Book of Superman was written by Paul Levitz, who as ex-publisher of DC Comics, and a comic book writer himself clearly knows his stuff. Along with a three-page introduction to the iconic character (which for some reason is also printed in French and German), detailed and informative captions written by Levitz also accompany the many of hundreds of images in the book. The content of the book has been reprinted from three hardback volumes, also written by Levitz: The Golden Age of DC Comics (2013); The Silver Age of DC Comics (2013) and The Bronze Age of DC Comics (2015). 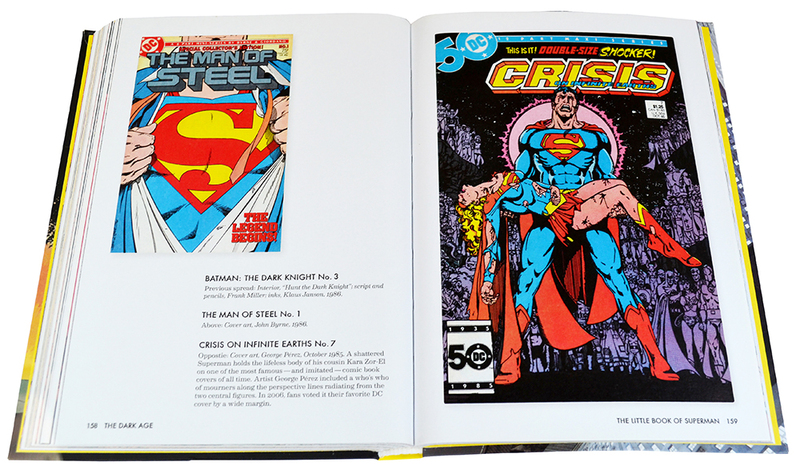 The content from those books was itself repurposed (and expanded) from Levitz’s giant 600-page hardback 75 years of DC Comics: The Art of Modern Mythmaking, originally published by Taschen in 2010. … page 159: the death of Supergirl (fans voted it their favourite DC cover). Despite its small stature The Little Book of Superman is an entertaining and informative read. Along with reproductions of comic book artwork there are some original pencilled covers, toy and candy advertising, photos of the Superman inflatable from the Macy’s Day parade and promotional material from the character’s various cinematic incarnations. 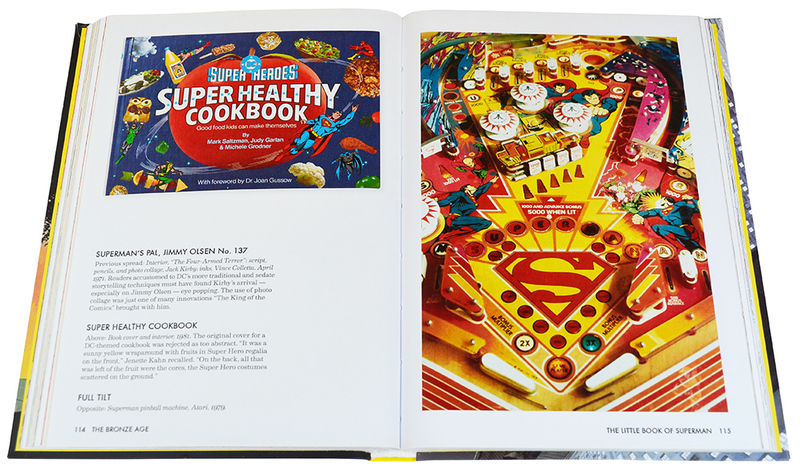 There’s even mention of a Superman pinball machine and cookbook, and let’s not forget his epic fight with Muhammed Ali in 1978. All-in-all Levitz does an admirable job charting Superman‘s rise from a kid’s comic book star to global icon. 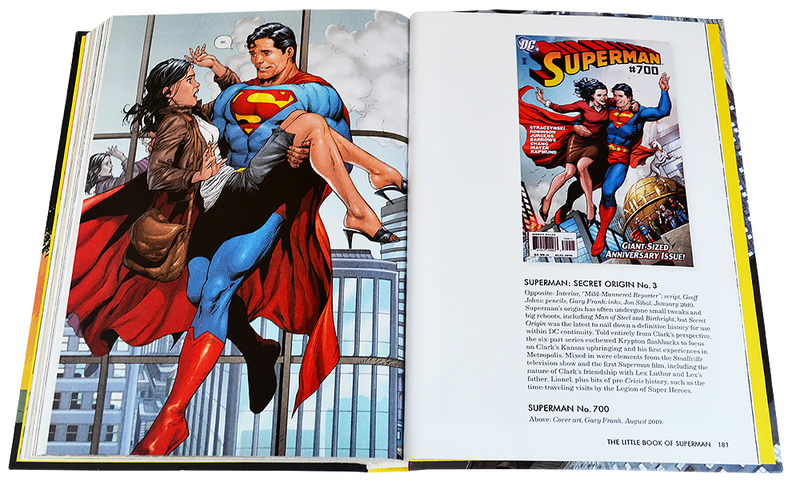 Along with The Little Book of Superman, Taschen have also published similar volumes on DC’s other two big-hitters: Batman and Wonder Women (also written by Levitz). Marvel Comics fan needn’t mourn though, as Taschen have released four collections featuring The Fantastic Four, Spider-Man, Captain America and The Avengers, all written by Roy Thomas. Superman in the 21st Century (pages 180 and 181). The Little Book of Superman will appeal to all fans of The Man of Steel, both casual and seasoned. Even those who already own the four hardback books the content is taken from will still find this book entertaining (I’ve read the three ‘era-by-era’ volumes and still enjoyed this slimmed-down edition). With this pint-sized collection Levitz ably demonstrates that the appeal of Superman appears both universal and undiminished despite the character’s age. With that in mind, here’s to Big Blue’s next 80 years.